B active may assist in the improvement of general well-being and may be beneficial during times of stress. B active may improve energy and mood levels, relieve tension, stress and mild anxiety and improve stress adaptation. 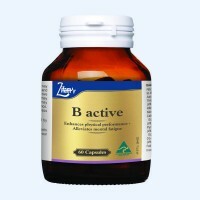 B active may reduce stress related fatigue and may promote vitality and stamina. B active may improve sleep and may reduce mental fatigue during times of stress and physical endurance. B active may assist in relieving symptoms of environmental stress and stress adaptation.